An elevated pulmonary arterial pressure, known as pulmonary hypertension, has numerous causes: CHRONIC LUNG DISEASE, which is diagnosed clinically and by abnormalities of lung function. 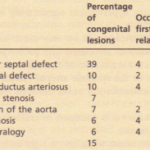 INCREASED PULMONARY BLOOD FLOW because of leftto- right shunting through a VSD, ASD or PDA. 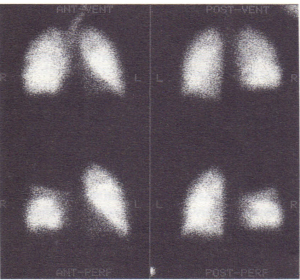 LEFT VENTRICULAR FAILURE, MITRAL VALVE DISEASE, LEFT ATRIAL TUMOUR OR THROMBUS, OR PULMONARY VENO-OCCLUSIVE DISEASE, which cause an elevation in the pulmonary arterial pressure secondary to an elevation of the pulmonary venous and pulmonary capillary pressure; the pulmonary wedge pressure is elevated in these cases. Pulmonary hypertension leads to enlarged proximal pulmonary arteries, right ventricular hypertrophy and right atrial dilatation. The pulmonary arterial changes depend on the aetiology of the pulmonary hypertension. Multiple peripheral pulmonary arterial stenoses can produce a syndrome that is similar to pulmonary hypertension, but the pressure in the distal pulmonary bed is normal or low. the second heart sound. Other findings include a right ventricular fourth heart sound, a systolic pulmonary ejection click, a mid-systolic ejection murmur and an early diastolic murmur due to pulmonary regurgitation (Graham Steell murmur). 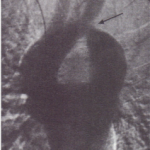 If tricuspid regurgitation develops, there is a pan-systolic murmur and a large jugular v wave. 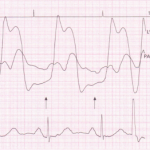 lead VI> and inverted T waves in right precordial leads) and a right atrial abnormality (tall peaked P waves in lead II). Other investigations are performed to evaluate the cause of pulmonary hypertension. It is particularly important to look for treatable conditions such as leftto- right shunts, mitral stenosis or left atrial tumours with echocardiography. Radioisotope lung scans and sometimes open lung biopsy are performed, e.g. in young patients with severe pulmonary hypertension of unknown cause. Pulmonary angiography is dangerous and is rarely necessary. Thrombus, usually formed in the systemic veins or rarely in the right heart, may dislodge and embolize into the pulmonary arterial system. Post-mortem studies indicate that this is a very common condition (microemboli are found in up to 60% of autopsies) but it is not usually diagnosed this frequently in life. Ten per cent of clinical pulmonary emboli are fatal. Conditions leading to the formation of clot in the systemic veins (and hence predisposing to pulmonary emboli) include prolonged bed rest, pelvic and lower limb fractures, pelvic or abdominal surgery, cardiac failure, pregnancy and childbirth, oral contraceptive drugs, malignant disease, chronic pulmonary disease and hypercoagulable states. Atrial fibrillation may allow thrombus formation in the right atrium, and septal or right ventricular infarction may favour thrombosis in the right ventricle. 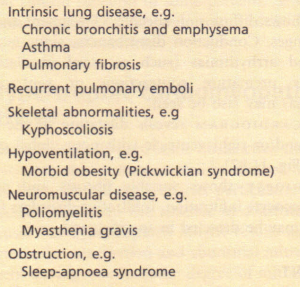 A small proportion (less than 10%) of pulmonary emboli are due to these cardiac causes. After pulmonary embolism, lung tissue is ventilated but not perfused, resulting in impaired gas exchange. After some hours surfactant is no longer produced by the non-perfused lung, alveolar collapse occurs and hypoxaemia is the result. The haemodynamic consequence of pulmonary embolism is an elevation of pulmonary arterial pressure and a reduction in cardiac output. The zone of lung that is no longer perfused by the pulmonary artery may infarct but often does not do so because oxygen continues to be supplied by the bronchial circulation and the airways. A small embolus may present with effort dyspnoea, tiredness, syncope and, occasionally, cardiac arrhythmias. A medium-sized embolus leading to pulmonary infarction can present with sudden onset of pleuritic pain, cough with haemoptysis, and dyspnoea. A massive pulmonary embolus presents as a medical emergency: the patient has severe central chest pain and suddenly becomes shocked, pale and sweaty, with marked tachypnoea and tachycardia. Syncope may result if the cardiac output is transiently but dramatically reduced. Physical signs vary according to the size of the embolus and the occurrence of pulmonary infarction: A SMALL EMBOLUS may reveal no abnormal signs apart from a few basal crackles. LARGE EMBOLI lead to a right ventricular heave, a gallop rhythm, tachycardia and a prominent a wave in the jugular venous pulse. The second heart sound may be loud because of pulmonary hypertension or soft if the cardiac output is very reduced. Continuous (systolic and diastolic) murmurs may be generated by turbulent blood flow around the embolic obstructions. WITH PULMONARY INFARCTION, a pleural rub and pyrexia may also be present. DEEP VENOUS THROMBOSIS. Although a clinical deep venous thrombosis is not commonly observed, a detailed investigation of the lower limb and pelvic veins will reveal thrombosis in more than half of the cases. The chest X-ray is often normal but the abrupt cut-off of a pulmonary artery or a translucency of an underperfused distal zone is occasionally seen. Later, atelectasis leads to opacities. An infarction may be visualized as a wedgeshaped opacity adjacent to the pleural edge, a pleural effusion and a raised hemidiaphragm. Past infarcts may be seen as opaque linear scars. 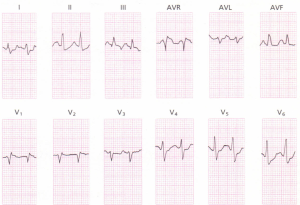 The ECG is usually normal except for sinus tachycardia. 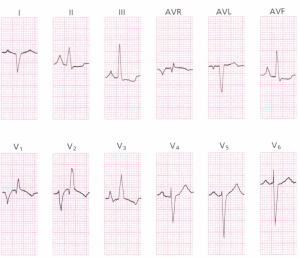 In relatively severe cases, however, right atrial dilatation produces tall, peaked P waves in lead II, and right ventricular hypertrophy and dilatation give rise to right axis deviation, some degree of right bundle branch block and T wave inversion in the right precordial leads. 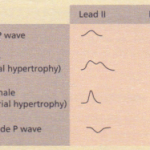 The classical pattern of an S wave in lead I and a Q wave and inverted T waves in lead III (Sl, Q3, T3), which reflects right ventricular ‘strain’, is not usually present. If pulmonary infarction has occurred, there will be a polymorphonuclear leucocytosis, an elevated ESR and increased lactate dehydrogenase levels. Pulmonary embolism usually results in arterial hypoxaemia and hypocapnia. A pulmonary technetium-99m scintigram may demonstrate underperfused areas . 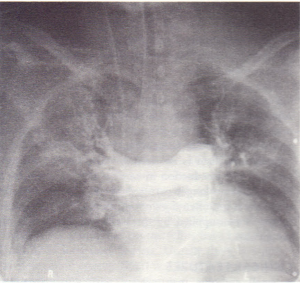 The specificity of this technique is greatly improved when combined witha ventilation scintigram performed after inhalation of radioactive xenon gas . The finding of a non perfused but ventilated zone is more suggestive of pulmonary embolism. Pulmonary angiography is sometimes undertaken if surgery is considered in acute massive embolism. The test is performed by injecting contrast material through a catheter inserted into the main pulmonary artery. Filling defects or obstructed vessels can be delineated. Angiography is hazardous but the risk may be reduced if contrast is injected into each pulmonary artery separately. If the patient is in extremis and the diagnosis is obvious, surgery should proceed without prior angiography. 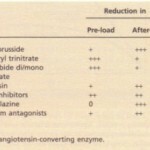 Prevention of further emboli The basis of therapy is intravenous heparin, starting with a bolus of 10000U and followed by the continuous infusion of 1000-2000 U hour:”. Oral anticogulant are usually begun after 48 hours and the heparin is tapered off as the oral anticoagulant becomes efftective Oral anticoagulants are continued for 6 months, depending on the likelihood of recurrcess 0f venous thrombosis or embolism. Fibrinolytic therapy such as streptokinase (250000 U by i.v. infusion over 30 min, followed by streptokinase 100000 U i.v, hourly) is often used fo following a major embolism. It may also be given into the pulmonary artery. Surgical embolectomy is rarely necessary, but when the haemodynamic circumstances are very severe there may be no alternative. Inferior vena caval interruption or plication, or the insertion of a filter into the inferior vena cava, may occasionally be necessary if anticoagulant or fibrinolytic therapy is contraindicated or fails to prevent recurrences of pulmonary embolism. Cor pulmonale is the commonest variety of pulmonary hypertensive heart disease. PATHOPHYSIOLOGY Pulmonary vascular resistance is increased because of effective loss of pulmonary tissue and because of pulmonary vasoconstriction caused by hypoxia and acidosis. The increased pulmonary vascular resistance leads to pulmonary hypertension, which initially occurs only during an acute respiratory infection. Eventually, the pulmonary hypertension becomes persistent and progressively more severe. The pulmonary vascular bed is gradually obliterated by muscular hypertrophy of the arterioles and thrombus formation. Right ventricular function is progressively compromised because of the increased pressure load. Hypoxia further impairs right ventricular function, and, as it develops, left ventricular function is also depressed. The clinical features are those of pulmonary hypertension and right ventricular failure occurring in patients with chronic chest disease. 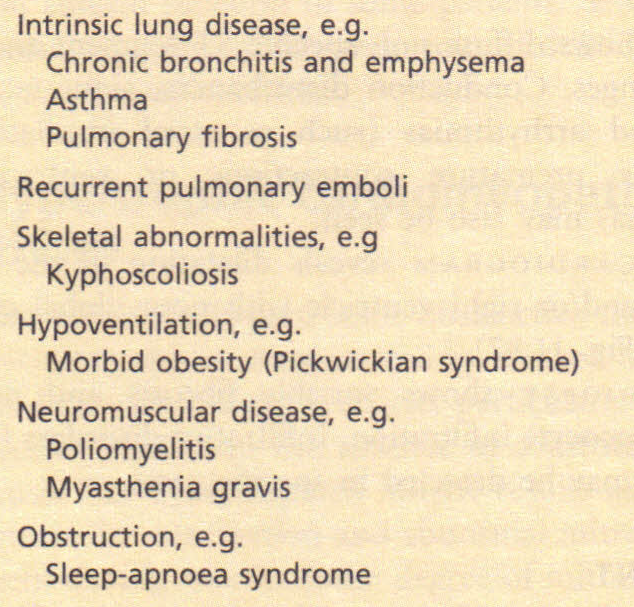 The dominant clinical picture depends on the type of lung disease. Vigorous therapy of the pulmonary condition may lead to marked improvement of blood gases and consequent improvement of the heart failure. Acute chest infections must be treated promptly. Oxygen therapy over a long period may reduce established pulmonary hypertension, with improvement in overall prognosis. Any heart failure should be treated. Extensive surgical removal of organized thrombus may be considered.